The M/L files are in bin format, as if saved on a disk drive. If another format would be more useful, please contact me with suggestions. The Basic files are in text format. The screen shots which replace and supplement the poor images from the books are courtesy of the MC-10 emulator of 'James the Animal Tamer'. 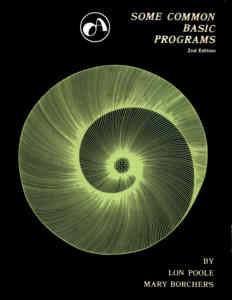 Programs from "TRS-80 Color Computer & MC-10 Programs", Cat 26-3195 by William Barden Jr. SOME COMMON BASIC PROGRAMS is designed for people who can use a variety of practical BASIC programs. The programs are written in a restricted version of standard BASIC and are compatible with many versions of BASIC now available to microcomputer users. Program descriptions, examples, and remarks accompany the listings to help you follow BASIC programming logic. Osborne & Associates, Inc., are microcomputer consultants. We will design your microcomputer based product for you, or we will help you do the job for yourself.